Mariano Téllez-Girón y Beaufort Spontin’s standard of living became a legend. 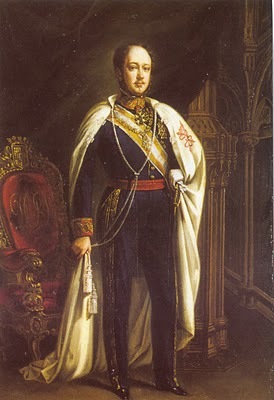 Within a few decades, the twelfth Duke of Osuna (1814-1882) was able to squander the immense patrimony of the most important and wealthy family in Spain. As Ambassador in Russia, he traveled across Europe on his private train, indulging in every extravagance. It is said that his horses were shod with silver alloy horseshoes. When his years came to an end, he had already accumulated a colossal debt and, therefore, a committee was formed of his creditors that put together an inventory and handled the sale of his assets. In three centuries, the Dukes of Osuna, in addition to having amassed an impressive number of titles of nobility, had put together a wonderful library of about twenty thousand volumes of printed books and manuscripts. In order not to disperse this important cultural heritage, in 1884, the collection was bought by the State and it was decided to distribute it among the libraries of the kingdom. Most of the books were incorporated to the Biblioteca Nacional in Madrid, while the rest went to the library of the Senate and to some of the leading universities in Spain. The Osuna Fund is still one of the finest collections of the Biblioteca Nacional de España, in particular with regard to the manuscripts. The collection of volumes of the Dukes of Osuna was formed based on the personal tastes of each duke and also by their individual political and military obligations. 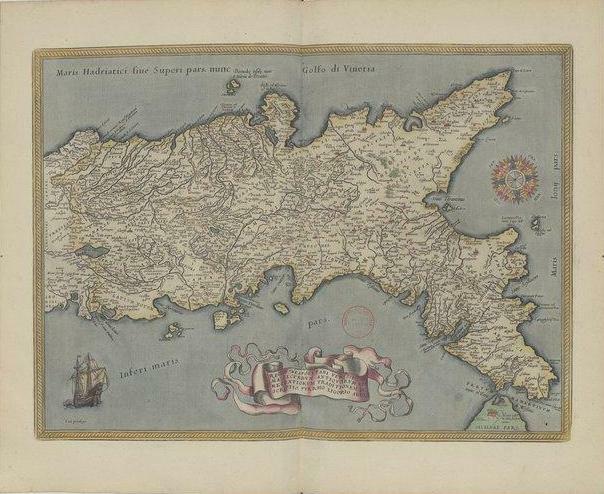 It is therefore not surprising that in the property of a family that included two Viceroys of the Kingdom of Naples (the first and the third Duke of Osuna were appointed to this position, respectively from 1582 to1586 and from 1616 to 1620), we find many texts and manuscripts of Italian origin. Among them, several relate to the practice of horsemanship and to the care and breeding of horses and are a real treasure trove for the history of equestrian disciplines. 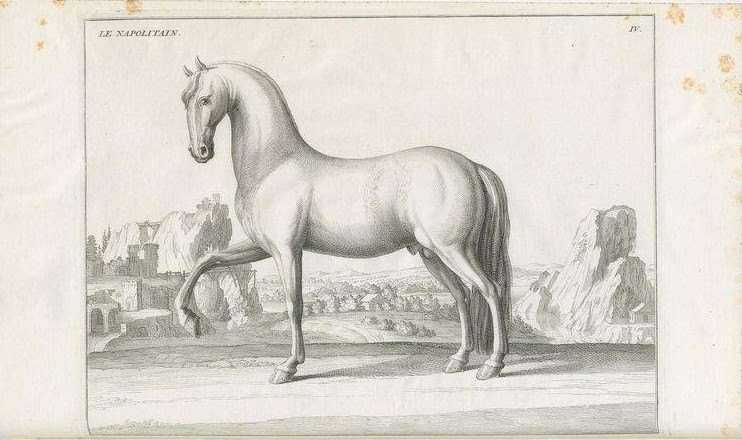 These are works hitherto unpublished and largely unknown to the main equestrian bibliographies, such as those of Menessier de la Lance and Frederick H. Hutt. I owe this discovery to Sabina De Cavi, brilliant Italian researcher who works at the University of Córdoba and that, although she only partially covers matters concerning the equestrian culture, pointed me to the richness and importance of this heritage. 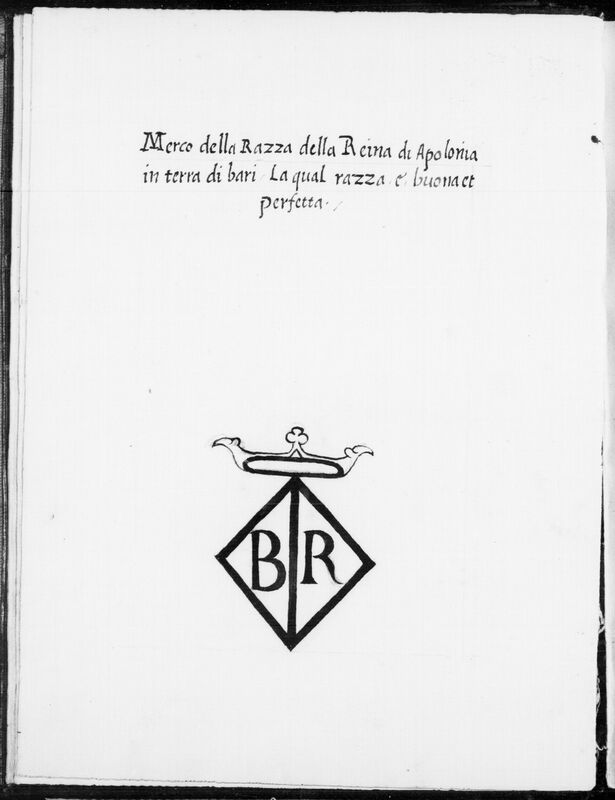 Breeds of the Kingdom / collected in this volume / shortly by Federigo Grisone Neapolitan gentleman / Where below gives many beautiful / advices suitable to the knowledge of foals and the care and ownership / of each horse. 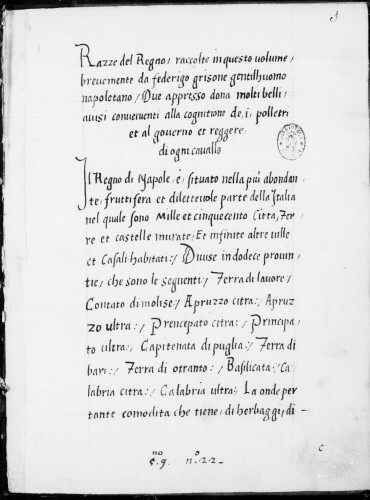 In short, it would be a work hitherto unknown from the famous Neapolitan gentleman who in 1550 published his treatise, Gli ordini del cavalcare (The Orders of Riding), the first book devoted to horseback riding in print. 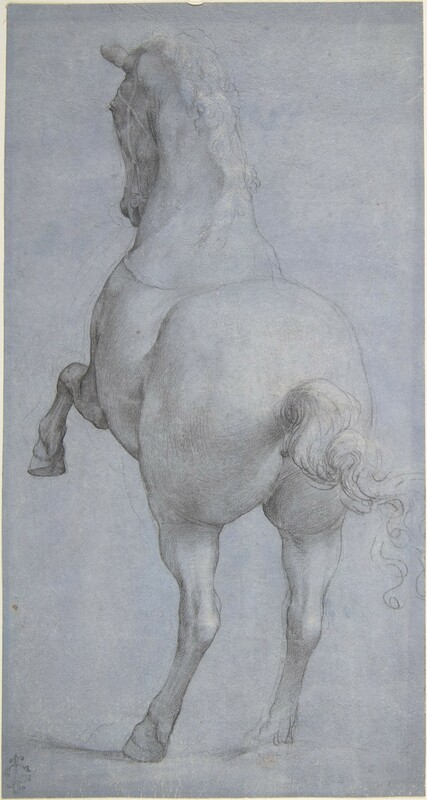 The Orders had an immediate and extraordinary success, becoming the true founding act of the new literary genre of the equestrian treatise and earning Federico Grisone the title of “father of the equestrian art” (Podhajasky, 1967, p. 18). Suffice it to say that, between 1550 and 1623, there were twenty-one printed editions in Italian, fifteen French translations, six in English, seven in German and one in Spanish. Not to mention the numerous manuscript versions, one of which is in Portuguese. The work contained in the manuscript of the Biblioteca Nacional is a sort of catalog of the best breeding farms (called razze, i.e. “breeds”) in the Kingdom of Naples, which are listed, showing illustrations of their brands and detailing some essential information on the property and, when possible, on the quality of the horses produced. The work is supplemented by a list of names of horses and by some guidelines for choosing the foals, the management of the stables and the feeding of horses. From the linguistic point of view, even if it is simpler and more basic, the text is written in the same style of the Orders of Riding, which is explicitly mentioned. From these aspects, it seems quite possible to attribute the work to Grisone. Since this is a work hitherto unpublished and entirely unknown to the historians and lovers of horseback riding, I decided to dedicate to it a detailed discussion. For this I have divided this article into two parts, so as not to exceed the size of the normal posts of this blog. In this first part, then, we will focus on the catalog of the breeding farms, while in a subsequent article I will cover the information on the evaluation criteria for the foals and the precepts concerning the stables and the feeding of the horses. The publication of directories of brands similar to the one presented in this manuscript is well known. Works such as the Libro de marchi de cavalli (The Book of the horses’ brands), published anonymously in Venice in 1569 and then reissued in 1588 and, above all, the remarkable La perfettione del Cavallo (The Perfection of Horse) by Francesco Liberati, published in Rome in 1639. Grisone’s manuscript is more like the first one, as the one by Liberati is far more wide-ranging. At the beginning of text, the author makes his eminently pragmatic purpose immediately clear: he wants to provide to anyone looking for good horses a clear picture of the best breeding farms where it is possible to obtain them. The description of the breeding farms begins from the royal breed, the so-called Breed of the King, which was the largest and was divided between two provinces: Apulia and Calabria. The horses of the breeding farms in Apulia were branded on the right thigh, while those coming from Calabria were branded on the left. The breeding farms of Apulia produced eight different varieties, or “partite” (parcels), of horses: the Great; the Imperial, the Royal, the Gentle, the Favorite, the Elected, the Small and the one of the Jennets. These were identified by an additional mark stamped on the right cheek of the animal. In the farms of Calabria, five “parcels” were instead distinguished as: the Great, the Medium, the Common, the Small, and that of the Jennets. These were identified by a brand on the left cheek. The drawings of the brands of 136 breeding farms follow. The enclosed annotations are, for the most part, very concise. 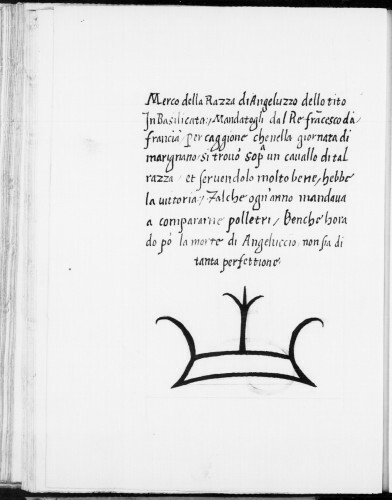 In most cases, the notes specify any variation in the branding of the different “parcels” of the breeding farm, or summarize brief judgments, such as “Brand of the Breed of the Queen of Poland in the territory of Bari (*), which breed is good and perfect” (5v), or “Brand of the Breed of the Prince of Salerno. In Basilicata, which Breed generally gives birth to Jennets of good size and of admirable virtue” (7r). There are, however, also critical remarks, such as, for example, in the case of the breeding farm of the Duke of Santo Pietro, in the Territory of Otranto: “the horses of this breed are good runners and dexterous but are of little strength”(12r). Or, as in the case of the Breed of the Marquis of Lucito, in Apulia, “from which come excellent horses although in general before it had more value” (14v). 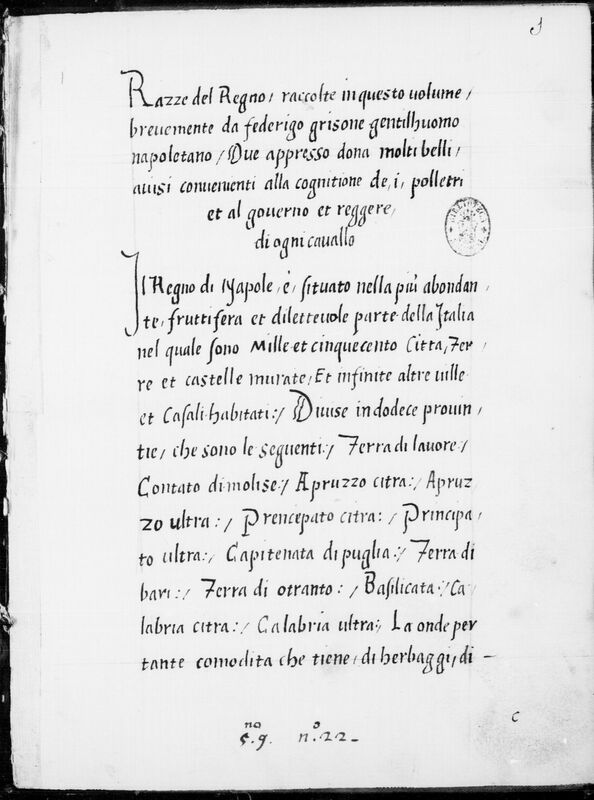 A note that is more interesting from an historical point, is the one about a breeding farm in Basilicata. 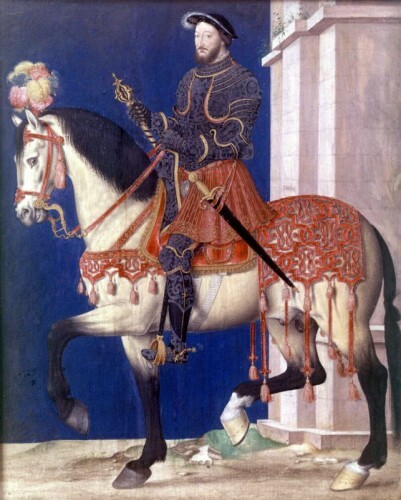 To this herd would belong the horse ridden by Francis I (1494-1547), King of France, in the fateful Battle of Marignano (13-14 September 1515), with which the French took possession of the Duchy of Milan. After presenting the brands of the main breeding farms, Grisone reaffirms that the herds of the Kingdom of Naples which give birth “to perfect and marvelous horses” (71r) are many more of those than he mentioned, but that he decided not to talk about some of them because they often change their brand, or because they have a few mares. 1518, and sovereign Duchess of Bari from 1524. 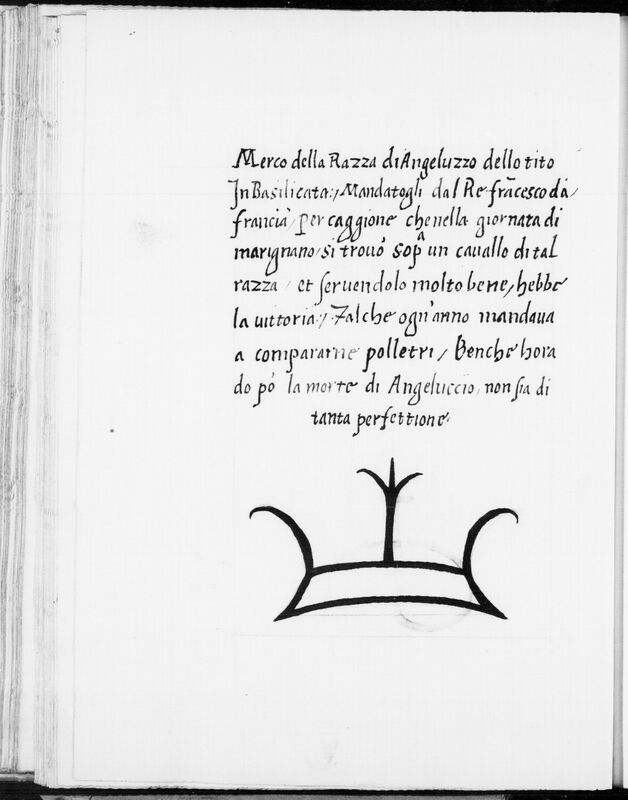 ANONIMO, Libro de’ marchi de’ caualli, con li nomi de tutti li principi et priuati signori che hanno razza di caualli, In Venetia, appresso Nicolò Nelli, 1569. DE CAVI, Sabina, Emblematica cittadina: il cavallo e i Seggi di Napoli in epoca spagnuola (XVI-XVII sec. ), in AA. VV. Dal cavallo alle scuderie. Visioni iconografiche e rilevamenti architettonici, atti del convegno internazionale (Frascati, 12 aprile 2013), a cura di M. Fratarcangeli, Roma, Campisano Editore, 2014, pp. 43-53. LIBERATI, Francesco, La Perfettione del cavallo, Roma, per Michele Hercole, 1639.